Visible Light Waves Visible light waves are the only electromagnetic waves we can see. We see these waves as the colors of the rainbow. Each color has a different wavelength. Red has the longest wavelength and violet has the shortest wavelength. When all the waves are seen together, they make white light. When white light shines through a prism, the white light is broken apart into the colors of the visible light spectrum. Water vapor in the atmosphere can also break apart wavelengths creating a rainbow. Each color in a rainbow corresponds to a different wavelength of electromagnetic spectrum. It is easy to see that the sky is blue. The light from the Sun looks white. But it is really made up of all the colors of the rainbow. A prism is a specially shaped crystal. When white light shines through a prism, the light is separated into all its colors. Like energy passing through the ocean, light energy travels in waves, too. Some light travels in short, "choppy" waves. Other light travels in long, lazy waves. Blue light waves are shorter than red light waves. Closer to the horizon, the sky fades to a lighter blue or white. The sunlight reaching us from low in the sky has passed through even more air than the sunlight reaching us from overhead. As the sunlight has passed through all this air, the air molecules have scattered and rescattered the blue light many times in many directions. Also, the surface of Earth has reflected and scattered the light. All this scattering mixes the colors together again so we see more white and less blue. 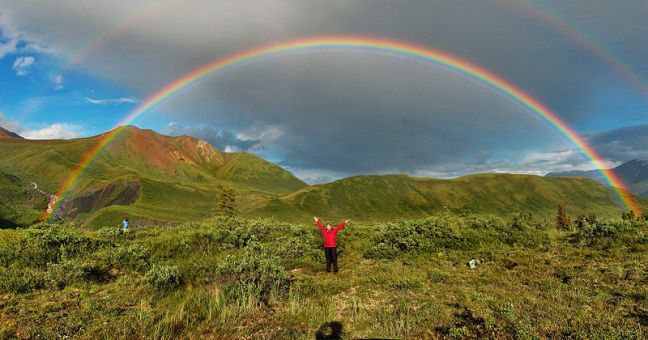 Why do we see rainbows in the sky? A rainbow is an optical and meteorological phenomenon that causes a spectrum of light to appear in the sky when the Sun shines onto droplets of moisture in the Earth's atmosphere. They take the form of a multi-colored arc, with red on the outer part of the arch and violet on the inner section of the arch. A rainbow spans a continuous spectrum of colors. Traditionally, however, the sequence is quantised. The most commonly cited and remembered sequence, in English, is Newton's sevenfold in order from longest to shortest wavelength: red, orange, yellow, green, blue, indigo and violet. "Roy G. Biv" and "Richard Of York Gave Battle In Vain" are popular mnemonics. Rainbows can be caused by other forms of water than rain, including mist, spray, and dew. Sunlight contains many different colors. Normally, we see all the colors mixed together as white light. We see a rainbow when sunlight separates into bands of different colors. These bands of red, orange, yellow, green, blue, indigo, and violet light are also known as the visible spectrum. A rainbow is created when sunlight passes through raindrops. Light travels through different substances at different speeds. When light travels through water, it slows down. The reduced speed causes light to bend or refract. To understand how a rainbow is made, it is helpful to understand how a prism works. A prism is a triangular shaped piece of glass. The path of a light beam changes as it goes through a prism. Glass slows the speed of light. 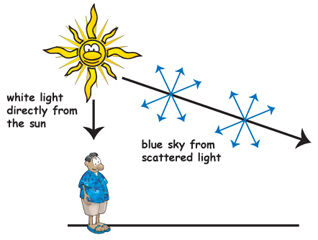 When light travels through a prism, it is refracted once while going in and again as it passes through. The refraction separates white light into its many colors. A water drop acts like a prism. Light refracts as it enters and leaves a drop of water. The refracting light is separated into the colors of the spectrum. When the sky is filled with drops of water, a rainbow is created. Light that enters the drops is refracted. Refraction makes each color visible in its own band. Each color of the spectrum has a slightly different wavelength. The different wavelengths bend in slightly different ways. 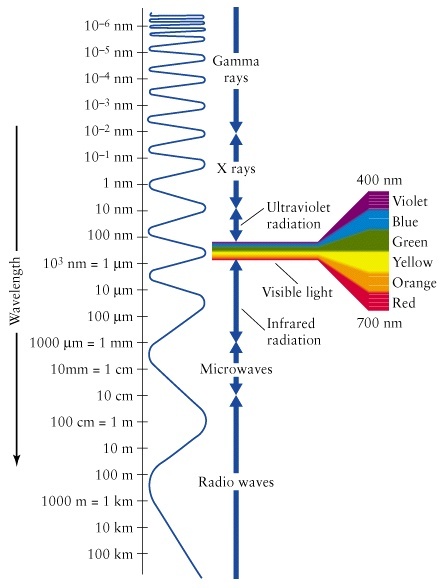 Long wavelengths bend the least, while short wavelengths refract the most. Red light has the longest wavelength and violet light has the shortest. The other colors have wavelengths that fall between. Because color refraction is consistent, the colors of the rainbow or any other spectrum look the same and appear in the same order. We use the memory device ROYGBV (Roy G. Biv) to signify the order of colors. The combination of all the separated colors creates the beautiful arching rainbow. Since light needs to pass through the raindrops, rainbows are always seen in the part of the sky opposite the Sun. We see the colors of a typical rainbow as light comes from our Sun. Any star similar to our Sun would create a rainbow with the same colors. Light from different types of stars would create different colored rainbows, some that we couldn't even see with our eyes. Astronomers study how a star's light separates. This separation is called the star's spectrum. it is after rain. The sun is always behind you and the rain in front of you when a rainbow appears, so the center of the rainbow's arc is directly opposite the sun. the only colors of a rainbow are red, orange, yellow, green, blue, indigo, and violet, but a rainbow is actually made up of an entire continuum of colors—even colors the eye can't see! light of different colors is refracted when it travels from one medium, such as air, and into another- -in this case, the water of the raindrops. When all the colors that make up sunlight are combined, they look white, but once they are refracted, the colors break up into the ones we see in a rainbow. sees their own "personal" rainbow. When you look at one, you are seeing the light bounced off of certain raindrops, but when the person standing next to you looks at the same rainbow, they may see the light reflecting off other raindrops from a completely different angle. In addition, everyone sees colors differently according to light and how their eyes interpret it. actually reach the end of a rainbow, where a pot of gold supposedly awaits. As you move, the rainbow that your eyes see moves as well, because the raindrops are at different spots in the atmosphere. The rainbow, then, will always "move away" at the same rate that you are moving.